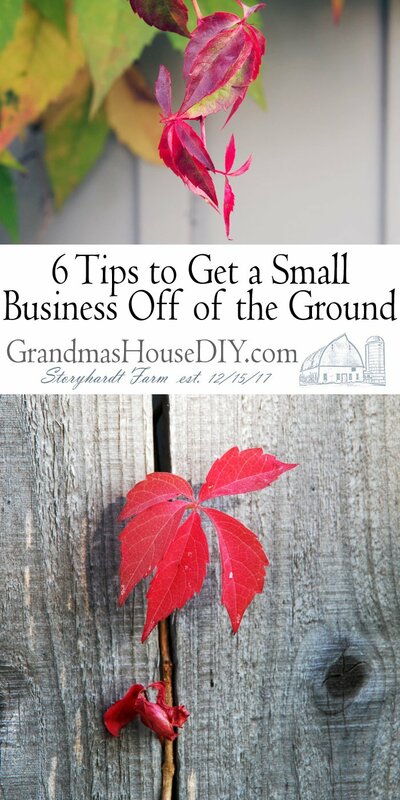 6 Tips to Get a Small Business Off of the Ground - For Bloggers too! As bloggers I think we have ALL read the advice to think of our blogs as a small business the minute we start. But it can be kinda hard to think of it as a business consider we’re often writing about our personal lives lol. However, I think it is important to take our blogs seriously and some of these tips are certainly spot on! The following is an article submitted to Grandma’s House DIY that I felt was really informative! Starting a new business can be very challenging, but there are a number of things that can help make the process go a bit easier. Below are six tips on how to make a startup grow and prosper. There is perhaps no greater obstacle to starting a new business than gathering the funds necessary to really get it off the ground. Few individuals actually have the capital up front to start a business from scratch. Most have to rely on support from family, friends, and business people who may have a vested interest in seeing the new business thrive. But in addition to finding support from donors, securing a loan may be a major part of the process as well. Finding the right loan to get a business of the ground is paramount to its success. Fortunately, there are many online offerings now that make this process as painless as possible. Look to Lightstream loan application for these types of loan needs. Bringing passion into the business is paramount to making it a success. Making a successful business often requires a lot of grunt work. If passion is brought in, this grunt work won’t seem like grunt work and Monday will become the best day of the week. Chances are half of all waking hours will be spent getting the business going, so enjoying it is essential to making it work. Getting down in the trenches with employees is an important part of this. This means doing some of the aforementioned grunt work. If the owner is willing to get in the trenches with the employees, the owner’s word will carry more weight and resonate more strongly than anything else. It’s a natural way to share and spread the owner’s passion for the business. From employees, to customers, to investors, everyone will have a judgement and criticism about the business, and often times give reasons why it won’t work. As long as passion and positivity are brought to the table, these negative vibes can be turned around. Entrepreneurs always have to be selling, which means a good deal of the population will be judging. As long as the product has positivity around it, good things will come. Nothing is more important to a business then making the sale. Making sure that every person in the business, including the owner, prioritizes selling, ensures that the product has a chance at success. Every contact with the world outside is an opportunity to sell. Always be willing to talk to the customer and ask for the sale on every occasion possible. Some claim that the age of quality customer service is dead. But the fact remains: it’s the companies who listen and treat their customers right – who respond to complaints, right their wrongs, and go the extra mile – that quickly build a loyal customer base and solid reputation to move forward with, even when the specific product or services may be a bit limited or still underdeveloped. Listening to customers with an open mind is also the least expensive way to learn about the customer base, which can help a new business continuously adapt, adjust, and improve based on their target audience. In the end, taking the time to listen to customers the first time will empower a company to succeed and save time and money spent on paying for mistakes or failing reputation. Whether selling a service or a product one of the keys is not to get caught up in administrative duties, but instead to focus on how the product or service will fit into the market place. As long as this is the focus early on in the development of the company, to the absolute exclusion of all else, the business will have a chance to thrive. Don’t worry about spending money on chic office furniture or high end gadgets; focus on beefing up the product or service being sold. By putting money into the business via the product being sold, it will come back ten-fold. Cultivating a work environment that employees are motivated and happy to come to is paramount to the success of any company. If employees are happy to come to work, the quality of work will be much higher. A good way to cultivate this is to have outings, happy hours, or interesting events that allows employees to let loose and have fun.